Our world is full of color. Our world is balanced. We have day, night. And in the night and in the day: the same hours. Life is like that. Music is like that, too. Sometimes we are not good. But the world as a whole is good. It’s arranged suitably for us. Composition, in painting, is like solving a math problem. It’s a calculation. You have to know where to put a color. And the lines: They support the whole thing and keep it from falling down. For our eyes – psychologically – it’s comfortable. When I do this, anybody can feel comfortable. It’s like architecture. Like a comfortable building on land that is sloping. Any section of a good painting has a good composition. You see a bad painting when they do it the easy way. It’s not right – you can see it. I can see it. There is no shortcut at all in this life. One has to really be sure of oneself. I had a little difficulty during the Derg time, the past regime in Ethiopia (1974-1987). Because they started to interpret things: “This looks like that,” they said. They had socialist thinking, but they did not know about art. I talked to my paintings during the regime. Then I painted over them to delete them. I didn’t want to leave paintings behind. I realized, if the authorities come, they will say, “This is you.” And they can kill you because of the feelings in the paintings. The feelings and also the content: Shortages. Queuing for sugar. Shootings. People were so afraid. And the color! The whole color of the country was dark. Definitely, I knew that it would pass. I knew that a better time would come. I believed that Ethiopia didn’t deserve these kinds of leaders. I was also hearing the roar outside, how the guerilla fighters were moving. Gradually, the brightness was coming. Life is extremes. Sometimes it gets sad. Most of the time, it is happy. I love the color of sunflowers. Sunflowers: they laugh. They are happy. I love laughing things. If you put them in the house, you’re happy also. When I paint them, I feel so happy. They are not easy, either. They are also challenging. But I am good at capturing them. I started as a kid. In the third and fifth grades, they entered my paintings in national contests, and I won. They knew I was a painter. One has to be honest. One has to be strong. One has to be a hard worker. Young women shouldn’t start anything they don’t like. They have to be sure about themselves, first. Secondly, they have to be honest, because like writers, musicians – art itself needs peace and honesty. They have to be honest. They shouldn’t try to copy from somebody else or sound like somebody else. They have to be creative themselves. They have to be patient. They have to be sure of themselves, if they don’t get money. They have to know themselves. Otherwise, they shouldn’t even start. For better or for worse. You marry art. Cal Lutheran was like my home. I loved the people. My adviser was Jerry Slattum. He was so good. I had to work hard – I’m a very stubborn person. Right now, when I get home, I have to get in the studio. Because I am here from Ethiopia, they invite you to the embassy, they invite you to a poetry reading, they invite you to a piano concert. I enjoy it so much, but I need to work. I love to be in my studio. For me, it’s getting away from the routine stuff outside. When I’m not in the mood, I drive out, see people, see the landscape. Sometimes I spend four days without getting out. Of course, they bring me coffee, or soda. Fortunately, the place I am in now is an apartment upstairs. It’s not a big apartment. It has a nice view. Green. It’s opposite to the palace. So I don’t get bored. After dinner, I sit, see the sky, the moon, the mountain. Without my knowing, it can soon be the morning. I painted a woman in the middle of the market. Because she doesn’t have money, she is checking which thing to buy. If she had enough money, she would buy enough. I know the feelings of women. I bring these things out. There are things I have not painted yet. I always think that the spirit of my parents, the feelings of my parents – that I have to bring that out. But I’m so scared, because they had good hearts. I don’t know how to put that in. So I’m just thinking and thinking. I’m scared of it, because their hearts were so angelic. I still have to do that. And Feben, my daughter, for instance. She’s beautiful, isn’t she? Her portrait, it scares me sometimes. Because she’s so beautiful and I know that she is beautiful. I say, let me wait, there is a moment to do it. I believe that. I also think that about my granddaughter. In the paper they wrote, “If Desta was not an artist, she would be a farmer.” (Laughs.) And I think it’s true. I love landscapes, I love to create things, I love to see things growing. Yes, I would be a farmer. 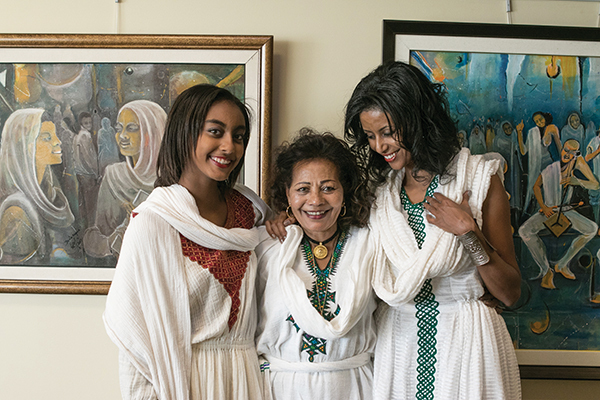 Desta was interviewed in December in the Gilbert Sports and Fitness Center, where a few of her paintings were on display.